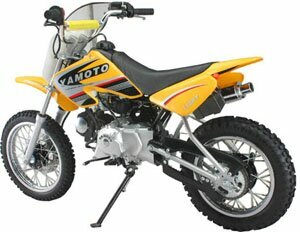 Raceway ATV's Yamoto PY-110: The Yamoto PY-110 is a stylish 4 speed semiautomatic dirt bike. 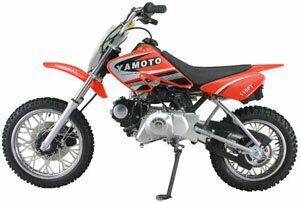 The Yamoto PY-110 is also another one of Yamoto's convenient 4 stoke motorcycle dirt bikes. The Yamoto PY-110 comes standard with two-starter system options kick and electric. The PY-110 Yamoto is available in two colors, Yamoto Red and Yamoto Yellow. 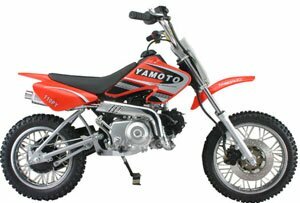 The Yamoto PY-110 is a chain drive single cylinder dirt bike. The Yamoto PY-110 has a great handling suspension with a front telescopic fork and a rear mono shock swing arm. The rider capacity for the Yamoto PY-110 dirt bike is 1 person. Like any of our Yamoto Redcat or Kazuma products the Yamoto 110-PY comes with a 6-month warranty and free shipping any were in the U.S. No tricks FREE! Replacement parts are never a problem when buying your Yamoto PY-110 from Raceway ATV. We always have your parts on hand. Raceway ATV is an authorized Yamoto, Kazuma and Redcat dealer. We are available to all of our customers 7 days a week with a toll free number. Please feel free to call us. Raceway ATV is a reliable and professional company that's been in the motorcycle and ATV industry for over 10 years. When it comes to your Yamoto, Kazuma and Redcat products there is no one better, Guaranteed. If you are not happy with Raceway ATV or any of our Kazuma Yamoto or Redcat products, with in 15 days we will take it back and refund your money. If you can show us someone else selling our Yamoto, Redcat, or Kazuma ATV's or motorcycle cheaper we will beat their price guaranteed! When we say we are the best Kazuma, Yamoto, and Redcat ATV dealers, we mean it. At Raceway ATV we are proud to say we are most concerned about riding safety so please read your Kazuma, Yamoto, Redcat owners manual before operating your ATV or Motorcycle Dirt bike. 4-Strokes,4 Speeds Semi-Automatic Electric Start .